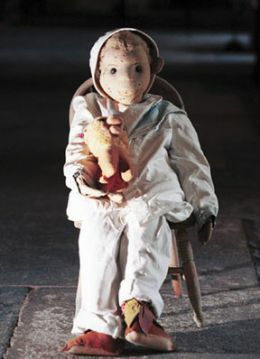 Robert the Doll is alleged to be possessed by spirits and has a terrifying reputation. In the late 1800s, Thomas Otto and his family moved in to a mansion at the corner of Eaton and Simonton streets in Key West, Florida now known as the Artist House. The Ottos were known to be stern with their servants, sometimes even mistreating them. It was the treatment of one such Haitian servant that provides a twist in this story. This woman was hired to take care of their son, Robert. One day, Mrs. Otto supposedly witnessed her practicing black magic/voodoo in their backyard and fired her. Before she left, the woman gave Robert a lifelike doll which stood 3 feet tall, had buttons for eyes, human hair (believed to be Robert's), and was filled with straw. Dolls that resembled children were not unheard of during this time, but this one proved to be special. 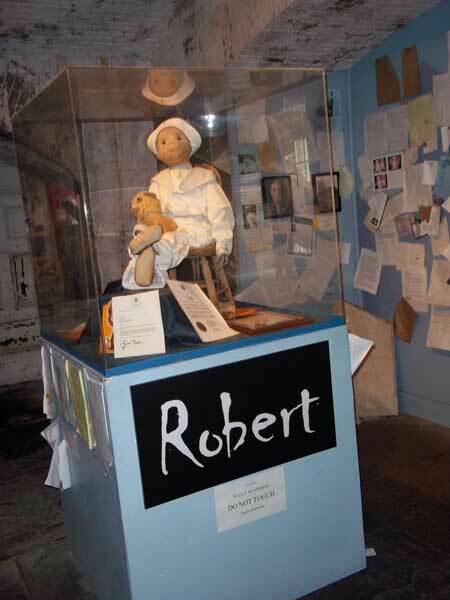 Robert named the doll after himself and often dressed it in his clothes. Robert, the doll, became his trustworthy companion. He took it with him on shopping trips into town. The doll had a seat at the dinner table where Robert would sneak it bites of food when his parents weren't looking. Robert would even be tucked into bed with the boy at night. Soon this innocent relationship took on a strange nature. Soon after, Robert chose to be referred to by his middle name, Gene, after being scolded by his mother. He told her that Robert was the doll's name, not his. Gene was often heard in his toy room having conversations with Robert. Gene would say something in his childish manner and responses could be heard in a much lower voice. Sometimes Gene would become very agitated, worrying the servants and his mother. She would, on occasion, burst in to find her son cowering in a corner while Robert sat perched in a chair or on the bed glaring at him. This was only the beginning. Household objects would be found thrown across the room, Gene's toys turned up mutilated, and giggling could be heard. Whenever these unusual acts took place, Gene always said, "Robert did it!" The boy took the punishment but always insisted that the blame was Robert's. Many claimed to hear giggling coming from the doll or to have caught a glimpse of him running up the steps or staring out the turret-room window at them. As the mischief grew, more and more servants took their leave as new ones were hired. The Ottos' relatives felt it was time to do something. With the recommendation of a great aunt, Gene's parents removed Robert from his care and placed him in a box in the attic. This is where he resided for many years. After the death of his father, Gene was willed his boyhood home. He decided to live in the Victorian mansion with his new wife. Gene had become a prominent artist (he designed the gallery at the Fort East Martello Museum) and felt the house was spacious and would provide a place for him to paint, he also had plans to make his own home a museum complete with a wax imprint of ‘the artist’s hands’ as a focal point, though this dream was never realized. He went to the attic and dusted off his childhood toy. He became attached to the doll despite his wife's displeasure. Gene would take the doll along with them everywhere they went. 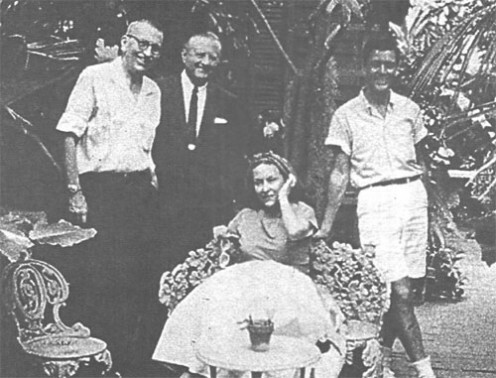 He even sat in his favorite little chair while Gene and his wife slept nearby. His wife found the thing very unsettling, insisting she'd seen the expression on its face change, but Gene would hear none of it. When she locked the doll back in the attic, Gene flew into a rage, demanding that Robert needed a room of his own where he could see the street, the Turret Room became Robert's domain. Finally, Gene relented and put Robert in the attic where he could do no more harm. Robert, it seemed, had other plans. Visitors in the house could hear something walking back and forth in the attic, though no one was up there, and several times demonic giggling interrupted the quiet evenings. Even the other citizens of Key West had heard about Robert and his evil habits. More than once it was reported that the doll watched people and mocked school children from the window of the turret room. Gene, who insisted that Robert was in the attic, was quite surprised to find him in the rocking chair by the turret room window. He seized the doll and took it back to the attic, only to find it again in the rocking chair when he came back down. Their marriage slowly became sour until Mrs. Otto supposedly went insane and died of unknown reasons. Gene followed soon behind. Robert waited patiently until another family bought the house. When their little girl, who was only ten years old at the time, found Robert in the attic, she claimed him for her own. 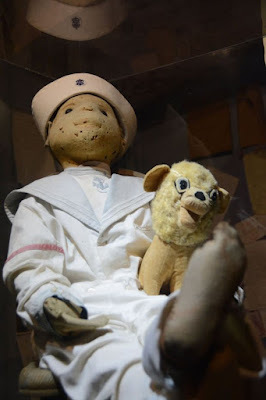 She claimed that the doll tortured her, even now, more than thirty years later, she steadfastly claims that the doll was alive and wanted to kill her. She is still deeply traumatized. Robert supposedly attacked people, sometimes locking them in the attic. Tenants heard footsteps in the attic room above them, also a plumber heard giggling and turned to find the doll had moved across the room on his own. People who passed by claimed to hear evil laughter coming from the Turret Room. For some time, Robert remained in the empty house by himself until a new family purchased the mansion and restored it. The doll was once again moved to the attic. This pleased it as much as the last time. The doll was often found throughout the house. On one certain night, Robert was found at the foot of the owners' bed giggling with a kitchen knife in hand. This was enough to send them fleeing from the home. 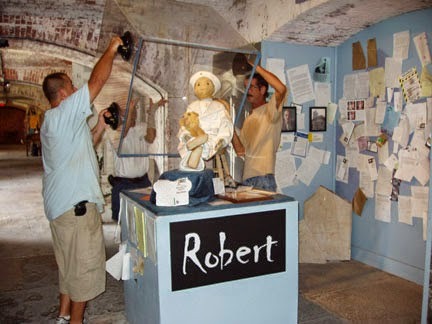 Robert was later moved to the East Martello Museum in Key West, where he sits perched in a glass box. Despite his new living quarters, the doll is believed to not have given up his menacing ways. Visitors and employees claim they have seen the doll move. His smile has been known to turn into a scowl. A museum employee once cleaned Robert and left for the evening, locking the doors behind him and shutting off the lights. When he arrived the next day, several lights, including the one near Robert's case, were on. Also, Robert was placed differently than when the employee last saw him. Stranger still, the bottoms of Robert's shoes were coated in fresh dust as though he'd been walking around the museum. More than once, employees have reported hearing a sound like someone tapping on glass as they pass Robert's case. When they turn to look, they have seen Robert's hand pressed against the glass. But Robert is not the only restless soul associated with the Artist House. When Robert was finally removed, it is said that Anne, the wife of Gene Otto, took up residence in the turret room to guard against the little monster's return. Some say he'll even curse you. If you want to take a picture of him, you must ask politely. He'll tilt his head in permission. However, if he doesn't and you take the picture anyways, a curse will befall upon you and anyone who accompanied you to the museum. The same will happen if you make fun of him. Cameras tend to stop working when pointed at the doll, only to resume normal function outside the museum walls. The Artist House, too, is open to the public, having been turned into a bed and breakfast. Visitors who stay in either the turret or attic rooms often report strange occurrences and sounds, as though someone is pacing the floor or watching them while they sleep. The staff just smiles and nods, knowing that it's actually Anne watching over them. Though Robert is available to take visitors year-round, the best time to introduce yourself, a practice recommended and followed by the museum staff, is during the month of October. During that one month, Robert is taken from the Martello Museum and housed in the Historic Custom House a few blocks down. It is during this time of year that he is said to be most active, and the employees always leave a bag of peppermints in his case with him in an attempt to cajole him into behaving. They swear there are always fewer candies the next morning. 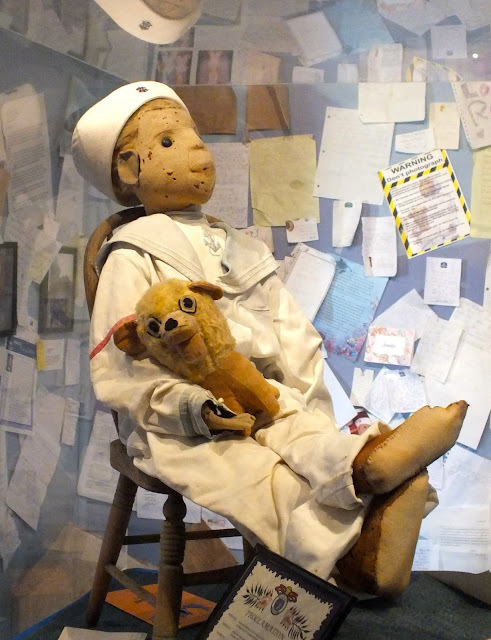 To this day, Robert remains well guarded at the East Martello Museum in his sailor suit clutching his stuffed lion, continuing his menacing ways. Robert was the inspiration for 'Chucky', the doll in the 1988 horror film "Child's Play". Say what you want about this but it's a great story that is highly intriguing. What Happened To The Splat Pack? Raz's Midnight Macabre 4 Year Anniversary! Ash VS Evil Dead Is Here!